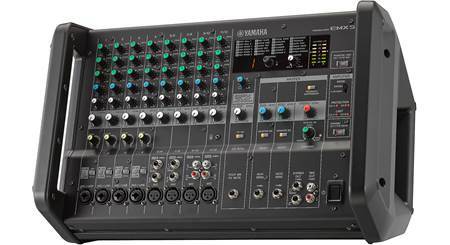 If you're looking for a PA system to use in a small club, auditorium, conference room, outdoor event, or place of worship, Yamaha's EMX5 powered mixer will provide the inputs, tone and level controls, and power you need for a successful presentation or show. The EMX5 combines two power amplifiers with a 12-channel mixer, so you only need to add speakers, mics, and cables for a complete sound system. This compact and multi-tasking little workhorse can power a couple of PA speakers with up to 630 watts each — not enough to knock down walls, but plenty enough for a small band, acoustic act, and even karaoke night. You can configure the EMX5's powered outputs to power your main speakers separately, or you can drive your main speakers with one output and your monitors with the other. 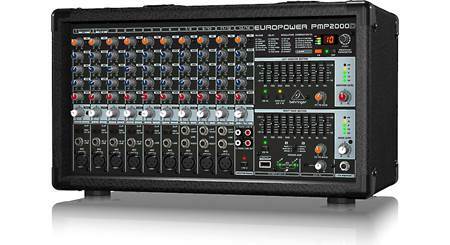 Preamp-level stereo outputs let you use your EMX5 with larger powered speakers for those bigger shows you may occasionally be asked to perform. 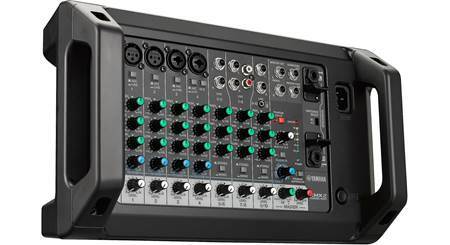 The EMX5 can take up to 8 XLR microphone inputs, 8 line-level 1/4" TRS inputs, 4 RCAs, and even has a 3.5 mm jack that accommodates the headphone signal from any music player. Channel 4 can be switched to Hi-Z mode to accept a high-impedance signal, like from a guitar pickup, without needing a direct box or adapter. Channels 1-3 include high-pass filters to eliminate bass rumble. Channels 1-4 feature one-knob dynamic compression to rein in any wild fluctuations in levels. You can sweeten the sound by choosing one of the 24 different acoustic effects, like reverb, delay, echo, or flange, and then adjusting to your taste. A feedback suppressor automatically helps prevent squealing. A Master EQ™ can add bass for heavy dance music and take it away when you're reinforcing voices only. Power protection and limiting circuits make sure that the show will always go on. 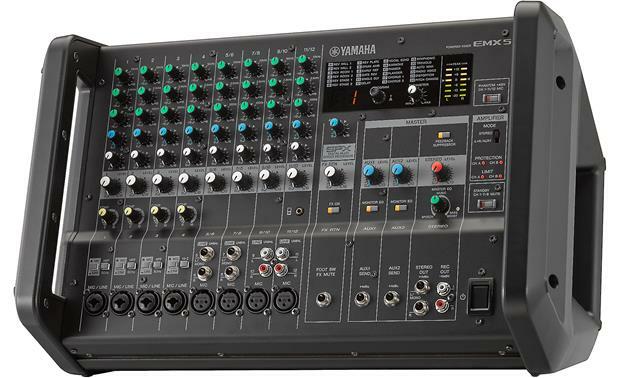 I purchased this Yamaha EMX5 system as a replacement unit. After connecting the speakers, the mike and the other equipment, I was amazed at the output capability of the EMX5. 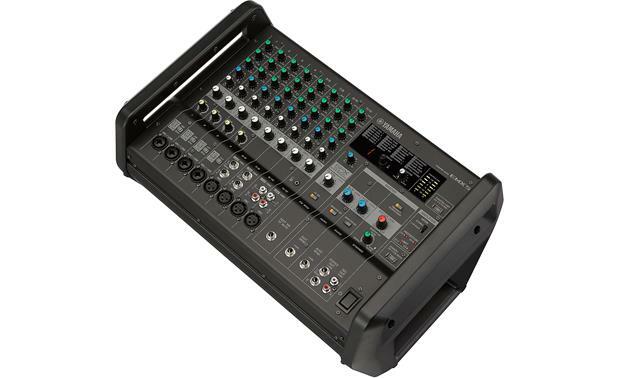 This mixer is great and I recommend this mixer to anyone whose looking a compact and powerful unit. Good job Yahama. Will it connect to Bluetooth speakers? Kelli, I don't think it does. But, this is a very good mixer. 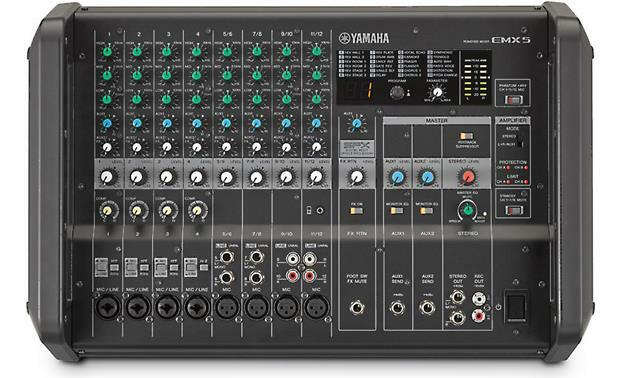 Overview: The Yamaha EMX5 is a 12-channel powered mixer that is ideal for musicians, performers, small to medium-sized clubs, or houses of worship. It has two sturdy handles which makes it portable and easy to set up, making it useful for speaking engagements, parties, DJs, and bands. 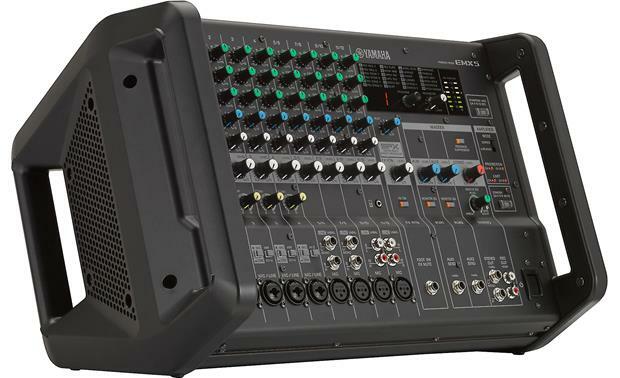 The EMX5 has 8 mic preamps and 4 stereo inputs. It has 2 powered main outputs with SpeakON jacks, 2 non-powered main outputs with 1/4" jacks, two 1/4" Aux outputs, and a stereo RCA record out. Mic/Line Inputs: The EMX5 is equipped with eight Mic/Line inputs (Channels 1-8) for connecting microphones, guitars, electronic musical instruments, or line-level audio devices. Channels 1 through 4 have combo jacks that support XLR and 1/4" plugs. These channels have Mic/Line switches, and Channel 4 has a Hi-Z switch that lets you plug in an electric guitar or electric bass with a 1/4" plug. Channels 5/6, 7/8, 9/10, and 11/12 can be used as single channels for microphones with XLR plugs, or stereo line-level pairs with 1/4" or RCA plugs. Phantom power (+48V) can be applied to the XLR connectors on Channels 1 through 11/12, if needed for condenser mics. Channels 5/6 and 7/8: Channels 5/6 have two 1/4" line input jacks. Channels 9/10: Channels 9/10 have two 1/4" line input jacks and two RCA input jacks. Both 1/4" and RCA jacks can be used at the same time, but the levels cannot be adjusted independently. Channels 11/12: Channels 11/12 have two 1/4" line input jacks, two RCA input jacks, and one stereo 3.5mm (1/8") mini-jack. The stereo 3.5mm mini-jack will take priority over the other inputs for Channel 11/12. Outputs: The EMX5 features two Speaker Outputs on the rear panel with SpeakON and 1/4" combo connectors. You can connect two 4Ω or 8Ω speakers to these outputs. You can also connect four 8Ω or 16Ω speakers wired in parallel pairs. On the front panel there are two 1/4" Stereo outputs, controlled by the Master Stereo level control, that will output a non-amplified signal to left and right active speakers or to an amplifier and passive speakers. The unit also has two 1/4" auxiliary outputs (Aux1 and Aux2) with separate rotary volume controls which do not affect the master level output. An Effects Return jack (1/4") lets you connect an unlatched-type footswitch, such as the Yamaha FC5, for toggling on/off the reverb effects. Compressor: Inputs 1 through 4 each have the 1-knob COMP function used in the Yamaha MGP and MG series models. You can dial in the right amount of compression as you rotate the knob to the right. The threshold, ratio, and output gain are all adjusted simultaneously. 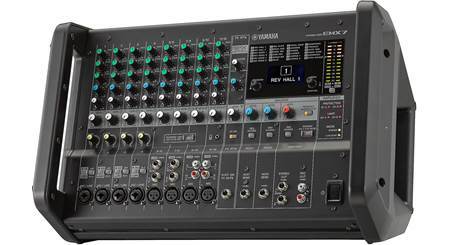 3-Band EQ: The Yamaha EMX5 features a 3-band EQ on each Mic/Line channel and each stereo pair. Each EQ band has a rotary control that lets you boost or cut the frequency by + or - 15dB. The dials have a center detent at 0dB for a flat response in the corresponding band. 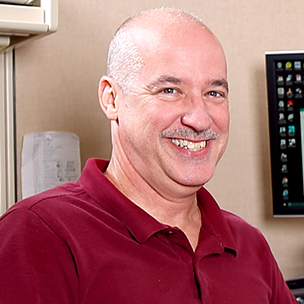 The EQ bands have the following center frequencies: Low 100 Hz, Mid 2.5 kHz, and High 10 kHz. Feedback Suppressor: The EMX5 is equipped with a Feedback Suppressor that utilizes a unique 7-band notch filter to instantly stops feedback with the push of a single button. Programmable Effects: The EMX5 has a powerful, comprehensive DSP section with 24 different effects. These professional-grade effects are the same as those found in the Yamaha SPX effects processors. You can add reverb and delay effects that emulate different performance environments, from small clubs to large concert halls. The available effects include: Reverbs (Hall 1&2, Room 1&2, Stage 1&2, Plate), Drum Ambiance, Early Reflection, Gate Reverb, Single Delay, Delay, Vocal Echo, Karaoke, Phaser, Flanger, Chorus 1&2, Symphonic, Tremolo, Auto Wah, Radio Voice, Distortion, and Pitch Change. The Effects section includes a rotary program dial and a 2-digit display for selecting the desired effect, and a rotary Parameter control to dial in the amount of effect. Level Controls: The four mono Mic/Line channels and the three stereo channels have individual rotary level controls. The Master level control determines the volume of the signal output from the Main Speaker and Subwoofer outputs. Left and right 7-segment LED level meters show the level of the Stereo output signal (-20, -10, -6, 0, +6, +10, Peak). When the Peak LED is constantly lit, the overall level should be reduced. Mounting: The versatile EMX5 can be oriented in several ways. It has a wedge shape that allows you to place it vertically on a table top with the controls facing the front. You can also orient it horizontally on the floor with the controls facing upward. With the optional RK-EMX7 bracket (sold separately), you can rack mount the EMX5 in a 19" equipment rack in 7U rack spaces. 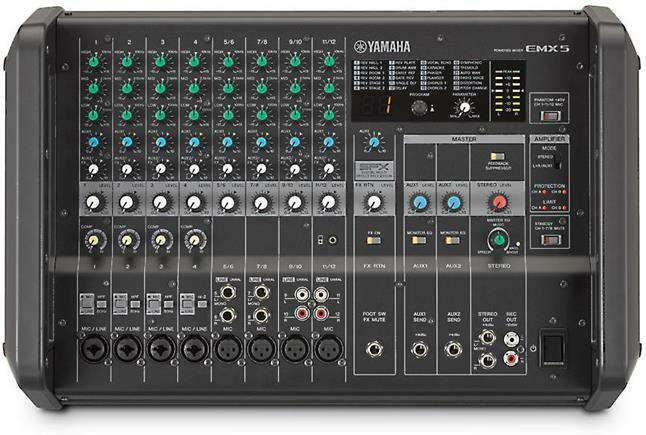 Vertical Orientation: Width: 18.375" Height: 12.125" Depth: 12.625"
Horizontal Orientation: Width: 18.375" Height: 10.875" Depth: 12"
Searches related to the Yamaha EMX5 12-channel powered mixer with effects — 460W max x 2 at 8 ohms.